A comprehensive proposal is worked out including recommendations on shared SAN storage, NAS and SAN, SAN management throughout the facility, HD, 2K and 4K workflow, 1-128 HD "uncompressed" "compressed" collision, concurrent editing and playback, TV-Station, Military rugged system, Medical, Mobile operation, Telecommunications, Training/simulation, Broadcast and video, Oceanographic, Environmental monitoring, Education, Optical design, Meteorological, Aerospace, Science, Vacuum coating processes, In order to efficiently and thoroughly obtain the optimum usage from digital content such a Zeiss and others spinning disk confocal and high-speed wide-field Colibri microscopy systems GVS9000 offer the real-time processing power for the data captured. t. To ensure that the existing equipment in your facility complements the proposed equipment, an integration engineering study is done, with a dedicated engineer staff is assigned for each project, to address all your specific requirement. GVS9000 VTR offers the ultimate file base non-linear VTR/DDR uncompressed capture for HD, SD, and Dual Link HD bringing you incredible uncompressed video, 8-channel AES and embedded audio, up/down HD/SD format conversion, and HD/SD component analog output. You also get dual-monitor desktop viewing for no-holds-barred design and editing with support for Apple FinalCut Pro, AVID, Autodesk Smoke, Adobe Premiere Pro. Features hardware RAW Uncompressed and codec for the DVCProHD, ProRes, JPEG, MXF, IMX, AVI codec. as well as hardware codec for high quality at live xtrem GVS9000 VTR is simply the highest quality, most flexible, low cost rugged design solution available. GVS9000 VTR supports the highest quality possible with SDI video features both 10 and 12 bit 4:4:4 Dual Link HD-SDI. Extensive audio support makes installation easier than ever, with 8 channel AES audio via either XLR or BNC connections, or embedded audio. AES input sample rate conversion eliminates the requirement for audio source synchronization—and you will never hear a click or pop. GVS9000 VTR provides a 12 bit HD or SD component analog video output. In the SD mode, the analog output can be switched to Composite NTSC/PAL or S-Video. The analog video output is independently assignable—for example, when working with HD, the analog output can be switched to the downconverter, allowing for broadcast quality SD component or composite video output from HD material. GVS9000 VTR offers unsurpassed cable connectivity for a video/audio capture card. Two versions of the breakout cable are provided: one with XLR AES connections, and one with BNC AES connections. Simply plug in the desired cable—they automatically configure. For SDI video, the breakout cables have 2 HD/SD BNC Ins and 2 Outs for single or dual link, 1 BNC for Genlock input, and 3 BNCs for HD/SD component analog video out. Also included is a 9 pin D connector for RS-422 machine control. Since the ultimate capture card needs the ultimate breakout box, we also offer a number of options in this area. Features full 10-bit Broadcast quality motion adaptive SD to HD up-conversion, HD to SD down conversion, and automatic HD/SD 12 bit component analog output. Allows much higher quality picture with true CCD or CMOS from your digital camera. With either high end or low cost digital cameras all you need is the HD SDI interface directly from the camera to capture the best pixel to pixel quality. What you see is what you get. You no longer have to sacrifice speed and storage. Utilizing the industry standard disk, you can rest assured that all the media are in a duplicate and secure removable canister that can be switched out and a new 5 hours uncompressed cartridge loaded in less than a few minutes. With a TRUE HD SDI capture rate of 1.4Gbit/sec and 3.0Gbit/sec raw output direct from the camera to disk, pixel to pixel, without the need for using any compresstion or reducing the quality or the size, the GVS GVS9000 VTR uses 9-pin support making it suitable for integration with most other GVS9000 VTR to sync. GVS9000 HD eliminates the need to transfer source material onto tape, yet integrates with the HD/SD authoring system as easily as a HD tape devices. GVS9000 HD is also ideal as a non-linear playback machine in a tradition linear edit suite. GVS9000 HD is ideal for presentations, and installations. Once again, the ability to play industry standard QuickTime pictures, synchronized to Timecode, or under Jog/Shuttle user control, make GVS9000 VTRs a valuable tool in many environments. 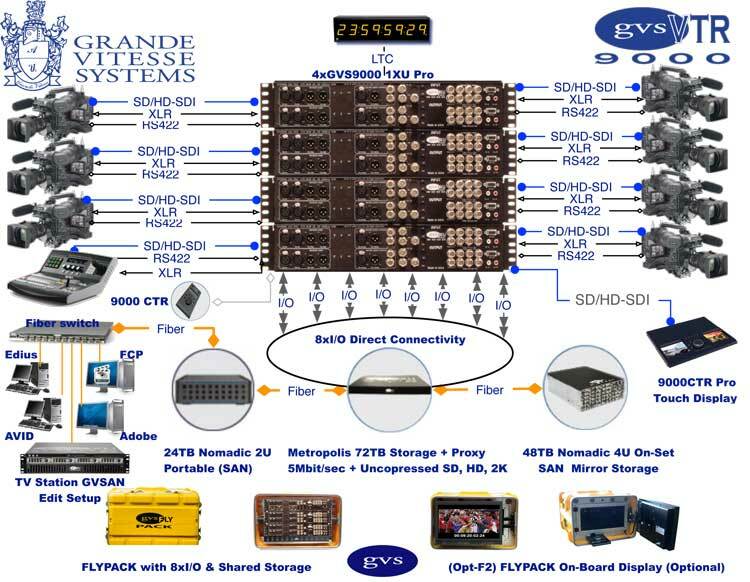 Several GVS9000 VTR systems can be used simultaneously in sync, for next generation multi-screen panoramic video walls, stereoscopic HD, Medical, Aerospace, Defense, Manfacturing, Scientific, Ocean Engineering, Environmental and other high quality media applications using a simple interface and easy management tools. The above ROI indicates the major benefits and associated profits with the GVS Metropolis Media Server workflow line. Primarily through low maintenance and operational costs, along with the deliverance of maximum speed and throughput, substantial increases in productivity become reality in multiple production environments. Having the ability to access to over 100-100,000 hours of footage information on a centralized high speed server with readily available SMPTE(Society of Motion Picture and Television Engineers), EDL, YUV component, SDI, MPEG, Audio, still, or Uncompressed source footage has now become a reality with the Metropolis Optical based Nomadic storage system. The operator spends much less time looking for footage, with the simple "Command Find" function or Windows Based "Search (Browse) Network Volumes" operators can find the desired file within seconds at around 100-100,000 hours of footage information. Queued projects disappear from the desktop machine in less than thirty seconds. Today's technology offers a tremendous amount of options for field recording - from simple tape, which is more rare but still done, to a removable media like P2, compact flash, CF cards and many more, including acquisition of the content on portable drives. Moving the drives to production involves 6 steps which we have covered in the production area, so now we are going to focus on the advantages of having the Metropolis solution in a Flypack in the field, and the benefits that it delivers for field applications. The workflow below shows the six step process that is involved in getting the content to production. While the steps are simple, at this point the process becomes extremely expensive if you try to increase the bandwidth requirement and the quality of the data that is being captured direct from the camera. It is common to maintain an MPEG compression which overcomes this tedious duplication process, but sacrifices quality. The biggest benefit of utilizing the Metropolis workflow in field recording is the enormous cost savings. The same drives from the field are used for preview and playback and can be taken directly to post-production, removing the need for all the other steps and maintaining a much higher bandwidth. There is no more need for duplication, data transfer or additional drives.